A Russian court on Feb. 8 gave Alexey Navalny a five-year suspended sentence on charges of embezzlement. A Russian court on Feb. 8 gave Alexey Navalny a five-year suspended sentence on charges of embezzlement. According to Russian law, he is disqualified for running for president in 2018. The opposition figure, however, said the sentence won’t put an end to his electoral ambitions. A court in the city of Kirov, located 480 miles northeast of Moscow, ruled on Feb. 8 that Alexey Navalny, an opposition politician and head of the Anti-Corruption Foundation, is guilty of embezzlement and gave him a five-year suspended sentence. This is the second time Navalny has been sentenced on the same charges. The first sentence, also a five-year suspended one, was handed down on July 18, 2013. Addressing the court with his final word on Feb. 3, Navalny said he perceived a “message” from the Russian authorities in his trial: “[they are saying,] 'We are kindly warning you one more time against getting involved in politics'. Well, thanks but no thanks.” He added that his electoral campaign would continue no matter what. Presidential press secretary Dmitry Peskov dismissed Navalny's allegations, noting that the Kremlin is “not particularly following” the case of Kirovles, (the company involved in the alleged embezzlement scheme), and that the presidential election is still too far away to even consider it. “What we are witnessing is a lawful judicial procedure,” was Peskov’s only comment. Even though Navalny won’t be able to legally run for president in 2018, (unless he wins the appeal), the politician's comrades believe it’s all down to the authorities' will to allow him to run or not, rather than to the letter of the law. In a Facebook post, Navalny's aide Leonid Volkov listed the possible legal loopholes: The European Court of Human Rights might overturn the new sentence; alternatively, the Constitutional Court or the Russian parliament might alter the law to allow Navalny to run. “This is the goal we have to work towards by way of political campaigning,” Volkov wrote. “I don't think a final decision on Navalny running or not has yet been made [by the authorities],” said political observer Stanislav Kucher in an interview with Kommersant FM radio. Kucher believes there would be a certain benefit for the Kremlin in allowing Navalny to run; a strong opposition candidate would add more weight to the expected victory of incumbent President Vladimir Putin. Even though Navalny is unlikely to win over Putin, the very fact of his running would earn him extra political capital, which is something the Kremlin wants to avoid, added Makarkin. 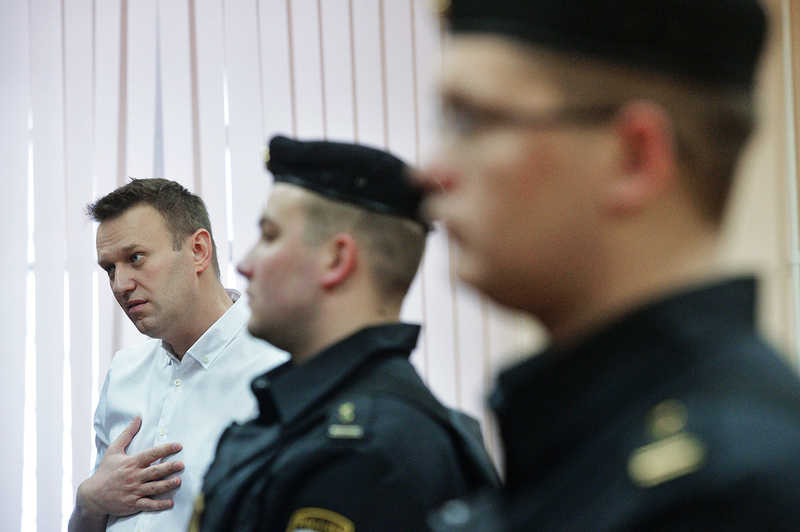 Navalny's latest trial did not differ much from the previous one - the same court, the same prosecutors, and the same arguments offered by both sides. According to the prosecution, in 2009 Navalny, then deputy governor of Kirov Region, and entrepreneur Pyotr Ofitserov were buying timber from the state-run company Kirovles at deliberately deflated prices and selling it at market rates. This cheated Kirovles of the equivalent of $270,300; the sum of the damage as assessed by the court stayed the same from the 2013 trial.The defense argued that Navalny and Ofitserov were buying and selling timber in good faith, and that their actions did not constitute a crime. Navalny has repeatedly stated that he believes his case to be politically motivated, and that the authorities are trying to prevent him from running for president in 2018.Since he was found guilty of embezzlement, a serious crime under Article 160 of the Criminal Code, Navalny has lost the right to run for president, said his lawyer Olga Mikhaylova. Navalny intends to appeal.